Does winning this battle count as deforestation? Pokémon X & Y's hype train is well and truly on the tracks now, rushing through the internet's wilds ahead of its worldwide October release. Poorly thought-out metaphors aside, there's a new trailer online for us all to enjoy. This footage made its debut in Japanese theaters with the release of Pocket Monsters Best Wishes! The Movie: ExtremeSpeed Genesect: Mewtwo Awakens earlier this month in Japan, which we're sure did well despite its slightly over-the-top title. It includes the first appearance of new tree-like 'mon Oorotto, which was initially revealed — sort of — by scribbled illustrations that spread around the web courtesy of excited fans that had been to see the movie. Check it out below and bask in its Pokémon glory. Thanks to Zak Islam for the tip. Wow, love the title of the movie! I need a title like that to make myself sound vaguely mysterious and exciting. I wonder if Oorotto is going to have any relation to Sudowoodo? If the game is being released worldwide at the same time, why can't we have a trailer in English? I agree with Litleo; "oooOOOooo!!!" Amazing! I wish we got that 3DS XL color over here (The X Y Blue one) and the movie! Game looks better and better with each new trailer! "Pocket Monsters Best Wishes! The Movie: ExtremeSpeed Genesect: Mewtwo Awakens". Okay, then. By the way, I hope the "pet your pokemon" thing isn't mandatory. Felt pretty stupid doing that in Kingdom Hearts 3D: Dream Drop Distance. 3DS game of the year, most likely. Cannot wait. @Footballer42 Well, they already said it's being retyped to the new type, Fairy. I suppose it's a given that it will be featured in the game that way. That looks just like any tree pokemon any fan would've come up with. @SpinelessOyster I would love that! I always thought that Sudowoodo deserved some kind of evolution/prevolution. @PokemonDemon He does have a pre evo with Bonsly though right? This guy looks to me like he'd fit perfectly into that family, but I suppose that would almost make too much sense. oorotto looks like something i saw while playing mariokart on the ds. i think it was the luigi's mansion course. Anyone agree with me? I saw an underwater battle! 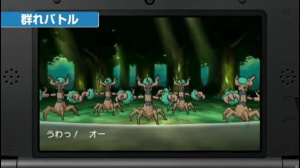 @SpinelessOyster Sudowoodo is a rock type and these appear to be grass as there in a forest and not a cave. Unless the "leaves" on there bodies are actually moss covered rocks its safe to say its a new Pokemon or perhaps even an evolutionary line. @Blue_Yoshi It's possible. There is a couple other similar looking Pokemon that have nothing in common. Though in Silver/Gold Sudowoodo did appear in a route that had nothing to do with rocks and caves. I Hope that Pokemon edition 3DS XL comes to America! If in does, I will finally upgrade from my aqua blue original 3DS. I will never understand why people obsess over thinking a Pokemon will be connected to another one because they look similar. Like those morons that thought Noivern was related to Swoobat because they are both bats but look nothing alike.and different typing. I love the interaction with the Pokemon Feeding and petting them looks like fun and Does Oorotto and Sudowoodo relate?? This is my most anticipated 3DS title, and has been since I bought the thing at launch. can not wait for this game. i wish it was october already. I think orrotto is going to be a grass/ghost type. Ha ha, good call, definately lifted straight from that course. @Weedy Right? When i first saw this, i immeadiately thought back to the days of mariokart ds. Oorotto reminds me of that Tree-like Digimon.. Now what's his name again? Wow..could the 3ds could of eliminated its slow start by making b and w 2 a 3ds exclusive? Maybe?